Thomas McLaughlin was born in Drogheda in 1896. He studied engineering in UCD, graduating with a B.Sc. in 1916 and an M.Sc. in 1918. He took up an appointment as an Assistant Lecturer in Physics at University College Galway and while he was there, he qualified with a BE degree in 1922 and a Ph.D. in 1923. In Galway, McLaughlin was greatly influenced by the then Professor of Civil Engineering, Frank Rishworth. It is believed that Rishworth instilled in McLaughlin the idea of harnessing the Shannon. In December 1923, McLaughlin took up a position with the firm of Siemens-Schuckert in Berlin. While he was there he came up with the plan for hydroelectric power generation on the river Shannon. He returned to Ireland to persuade the Minister for Industry and Commerce that his idea would work. The Irish Government decided to proceed with McLaughlin's plan and in 1925 work began on the construction of the "Shannon Scheme" as it was called. 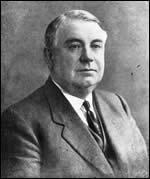 In 1927 the Government formed the first state-sponsored body, the Electricity Supply Board (ESB), and McLaughlin was appointed the managing director. McLaughlin went on during his career to persuade Governments that electrical power should be transmitted to the entire country, even very remote areas and islands at no cost. We refer to this as the "Rural Electrification Programme". McLaughlin retired from the ESB in 1958, and he died in Spain in 1971.